What do I want to have on hand besides a bunch of 9mm ammo? Glock disassembly tool? Or is an AR15 firing pin plenty? hks mag loader your thumbs will thank you! MY Glock disasembly tool is a nail I found on the range, it works great and is easily replaced if lost. Glock 17 mags. 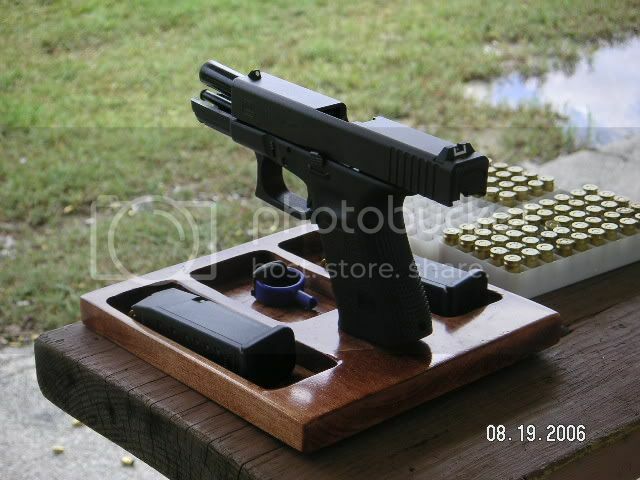 And maybe a Glock 18 mag for the "Oh Wow" factor at the range. 3/32 inch punch (no "disassembly tool" necessary) and a general round of humorous disdain for idiots that would tell you that your Glock is some sort of ammunition primed hand grenade. More mags and a decent Kydex holster. More mags and a decent Kydex leather holster. As long as they say "Glock Austria" on them, yes. There are a number of different followers for the 9mm mags. I think they are at revision 5 now. I own Glock mags with "9mm 3", "9mm 4", and "9mm 5" followers and they all work fine. Marine striker cups... a MUST HAVE for the ubertactical G17 owner. welcome to the G club, Dan. I don't know if all mags are "created equal"...the newer ones are referred to as "drop free" style. The meek shall inherit the debt. Don't Fear...Be Aware, Prepare, and Train. The original Glock mags ("non fully metal lined") were designed to NOT drop free when fully loaded. Later they were modified ("fully metal lined") to drop free. I didn't even think to mention that as current production Glock mags are so cheap. During the AWB people made a big deal out of NFML/FML mags with the FML mags selling for more. Unless you are buying old used Glock mags you will probably never have a NFML mag. What about G17 mags in a G19? I believe there is some type of sleeve for the gap? They work fine. I've never heard of a sleeve for G17 mags in a G19, although I've seen them for the subcompacts. The G19 grip is long enough for it not to be a big deal. I carry G17 mags as spares for my G19, and don't worry about the gap. 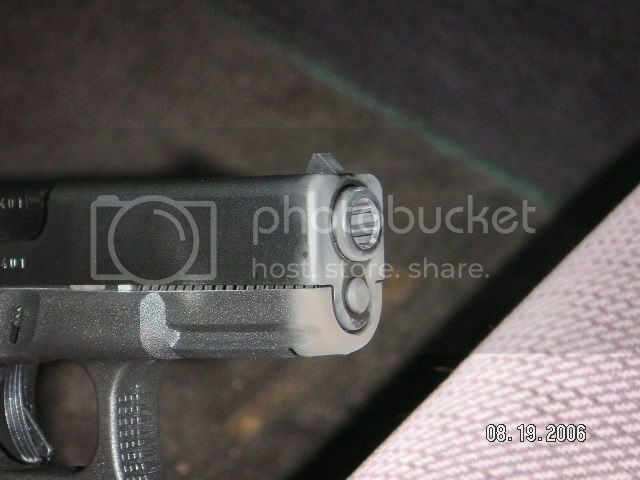 It won't be long until you realize the need for a Factory Glock extended slide release lever. BPD is just about as bad as BRD except cheaper to feed. Meprolight Night Sights, spare mags, ammo, A Glock Disassembly tool (punch), and a good quality holster (leather, Kydex, carbon fiber). Good Holster, Good Mag Carrier, Good Gun Belt, More Mags, Lots of Ammo, and Training. Holster: I like the Don Hume Prefered Conceal Carry IWB or Milt Sparks Summer Special. Good Mag Carrirer: Don Hume 740 Sereies with belt loops (Double Carrier). Good Gun Belt: The Wilderness Instructor Belt. 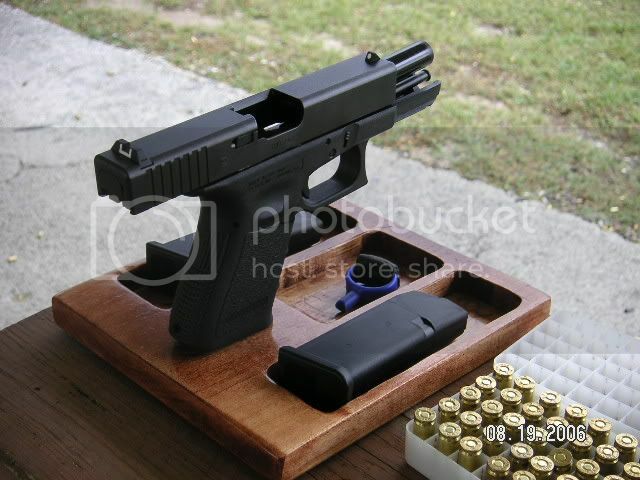 More Mags: Glock 4th Gen.
Lots of Ammo: What ever is cheapest. Training: Tactical Response out of Camden, TN. They are very very Glock Friendly. They will try to convince you to get those Express Big Dot Sights, they are kinda nice, not my cup of tea but nice. Woot Woot, my wife got me a membership for are 1st wedding anniversary. What's your take on getting more of the copper colored grease? I like Blue Wonder to clean, and Militec-1 to lubricate. Nice Glock. Gonna have to get myself a 19 for sure. Same. I have 3 SIGs. 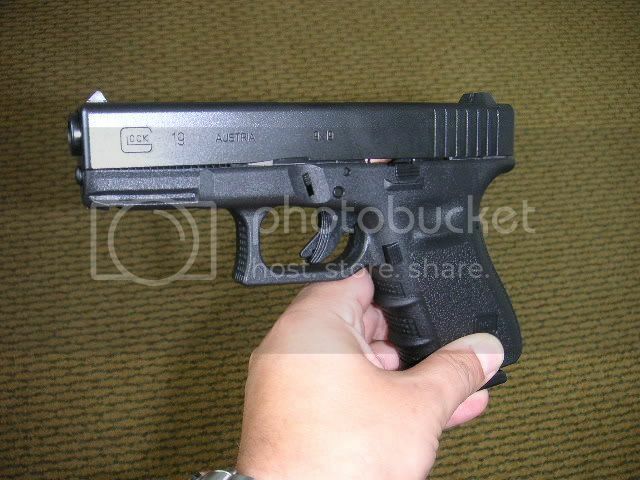 Had a Glock 17 but sold it. The quickest way to a man's heart is through his ribcage. Excellent choice in getting the 19. I love mine. Fits perfect in my hand and conceals great. I use a Sidearmor IWB and have no complaints. Ill let you try it out next time we shoot together. I'm still shopping around for some night sights. I just wish I could try out a few diffrent ones before I chose a set. Its up in the air between XS and Heinie Straight Eights. Anyone have any experience with these? 127 grain Winchester Ranger T ammo is very good for defense. "Look...a flock of flying brass"
"Wound my heart with a monotonous languor"
I owned one of the first thousand Glocks ever imported into this country... A Glock is a good and faithful servant. Extended Glock Factory slide release is great. I have it on all three of mine. You do not need +2 extensions on your mags, just buy G17 mags for your backup mags and ignore the gap. Buy a couple of the 34 round magazines for your BOB. The gun still shoots well with this mag in place. Buy ammo. Alot of ammo. Practice. You will not wear out a Glock. As to sights, The XO Big Dots are great... to my eye. I have them on my G26 and they are very fast. Ditch the stock sights when you find whatever appeals to your eye. Choose based on the premise that this is a defensive weapon that will be used to respond to a already presented threat... Hence the practice of the flash sight picture. There are many options for the Glock. The XO's install quickly and are quite rugged. Their customer service is a bit like RCBS... great by all accounts. Holsters... The Glock factory plastic holster and single mag pouch are cheap and OK for casual range use. Holsters are the most personal of choices, even over sights. Why? Because I do not care how tricked out the pistol is, you won't carry it if it is uncomfortable. Fortunately, most are well designed and easily resaleable here or on Glocktalk if you do not like it. Good luck Glock noob.... Shoot well and often and you will see how this piece will become a extention of your hand. Enjoy life, it can be over in the blink of an eye. 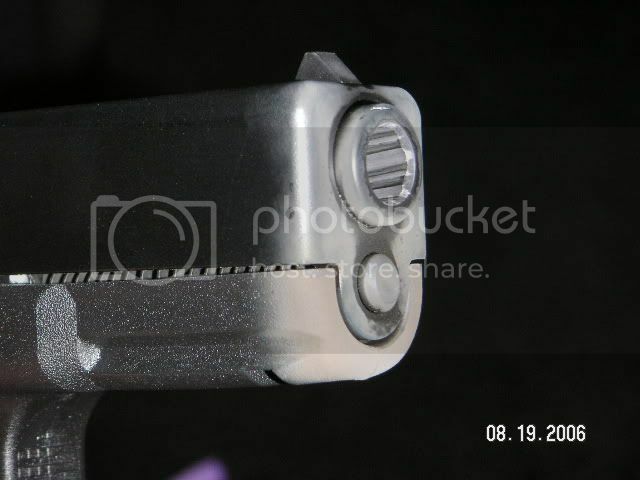 AR9mm had a boresighting laser and we screwed it into the barrel. The sights were a shade above a 6o'clock sight picture. 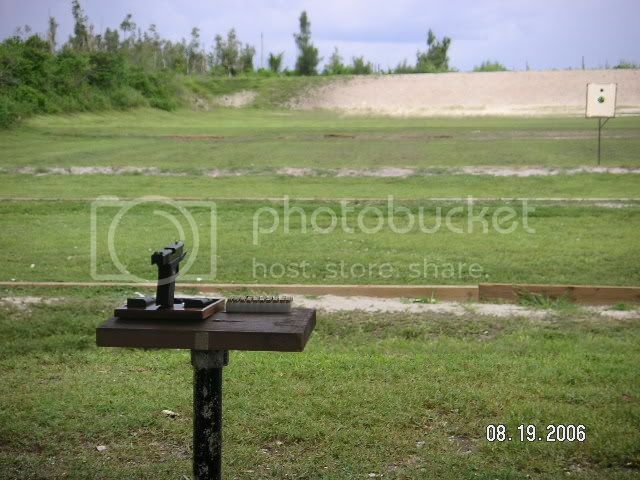 I fired approximately 300rnds today at Trailglades Park on the western edge of Miami. I was a little concerned about the grip but it turned out to be a non-issue really. Some muzzle flip but minor overall. 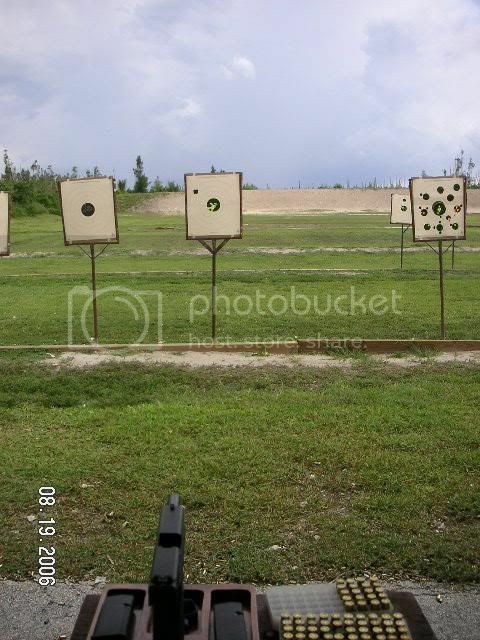 Optical illusion (someone else's target), the furthest I fired is 15yds. 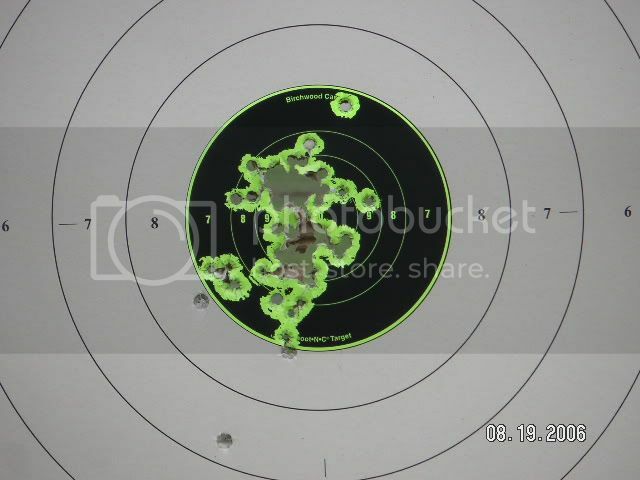 The target shown is at 25yds. The berm is 100yds. My first 31 rounds. Very accurate, the center of the picture above represents these rounds. My opinion of them in the G19 is that they feel like 40S&W rounds. A touch sharp in recoil. Less felt recoil in my Beretta 92. The difference was expected. I had about 200 rounds of this on hand and let me begin by saying that this is blasting ammo for sure. 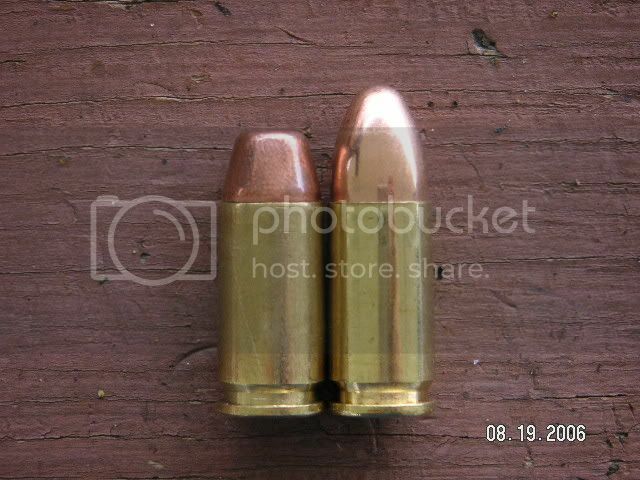 These are factory reloads, there were probably four different brass manufacturers in the rounds I had. I knew all this ahead of time but wanted to try them out anyway. In my opinion this ammo does not rate high enough to be considered training ammo. I had issues 90% of the time with failure to feed the last round of the magazine. This only happened on the last round. There is no previous round to help guide the final round so IMO the bullet is too short (for the G19 anyway). No issues with the Beretta 92 (besides the same accuracy issues). Last issue. Not always consistent in felt recoil, which probably explains the accuracy variances. I had bought the GA rounds to try out. I will be staying with WWB for all non-CCW uses (plinking, handgun classes, etc). This is great training ammo . Consistent recoil of all rounds, feeds all the time, every time. Excellent accuracy without needing to be perfect (as the Shoot-N-C targets revealed). After the range action, I loaded up two mags with Gold Dots, wiped off the front of the barrel and frame and stuck the G19 in my pants. Got three G19 mags from kblagg and an extended mag catch. Quick service! The followers show "6". ok to order the CTAC from GUNNERS ALLEY ? Better place to order from? CompTac direct? Do I want the open bottom or closed bottom? Looks like the Walmart on Kendal Drive. 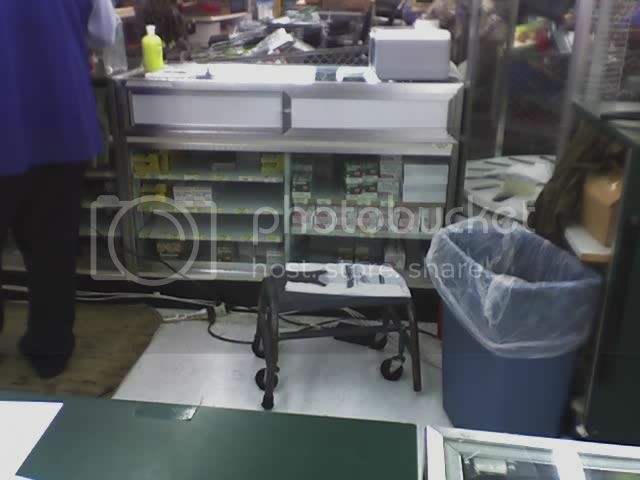 They always have shoping carts full of crap by the ammo counter lol. Is there a round in the chamber? ETA - Nice choice on handguns. I suggest the Novak night sights by Trijicon. They look and perform great! +1 on the sights suggestion! There's GOLD in them thar rails!! Don't worry about the factory grease, it will be gone before you know it. I use Rem-Oil and Militec-1. It's not so funny meow is it? I'm digging the Heine Straight Eight's. Still not sure about the round in the chamber comment; which pic ? Exactly what I was refering to. I'm just yanking your chain. It's supposed to be loaded right?